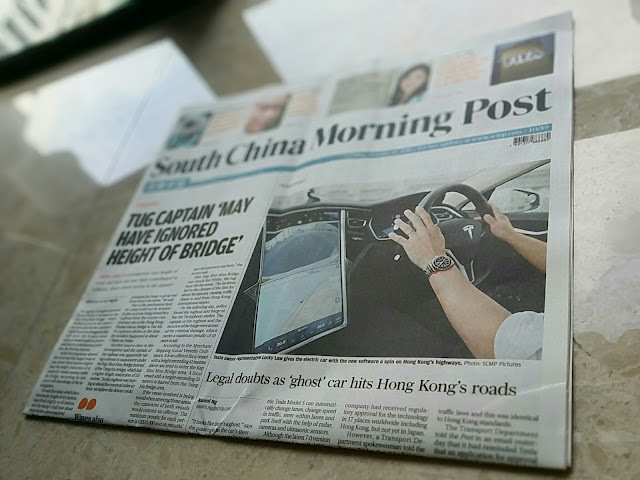 Thanks to Charged Hong Kong chairman Mark Webb-Johnson's referral, I was invited for a video interview and demonstration of the latest autopilot capability in the firmware v7.0 on my Tesla Model S. Never knew this article would make the front page on South China Morning Post (SCMP) the next morning, so it is really a great honour for me. This year's Charged Hong Kong Rally will take place on Sunday November 29th 2015. The route will be approximately 60km and well within the range of most EVs in Hong Kong. The event will start with a breakfast gathering at Hotel ICON, Tsim Sha Tsui. We've booked the whole green lobby, and arranged a breakfast buffet in that fabulous space. Valet parking is provided, as well as valet charging for those in need of a top-up (but given the number of electric cars attending, please limit this to if you really need it). There will be plenty of time for socialising, and the cars will be on display at the entrance to the hotel (allowing for plenty of photo and video opportunities). The schedule is for this event to start at 9am. We're pleased to be able to announce that after six months of application process, and vetting by both the Societies Office and Inland Revenue Department, effective 5th September 2015, Charged Hong Kong (電動香港) has been recognised as being a charitable institution, and is exempt from tax under Section 88 of the Inland Revenue Ordinance. This is something that your executive committee has been working hard on since our formation earlier this year, and we are incredibly grateful to the Inland Revenue Department for their kind assistance with this process. Charged Hong Kong is proud to announce that VITALAGE has agreed to sponsor Drive Electric Week 2015 Hong Kong. VITALAGE is an Aesthetic Medical Centre that provides personalized treatments that are clinically proven to be safe and effective. Our experienced team is passionate in helping every visiting patient to enhance their skin health & beauty. The VITALAGE name denotes “the most dazzling time of our lives”. It is an extension of the company’s mission to support every client in her pursuit of a beautiful life – one that is as strong and dazzling as a diamond. VITALAGE is proud to support and sponsor the Drive Electric Week event organized by Charged Hong Kong. Charged Hong Kong is proud to announce that InsideEVs has agreed to help promote and sponsor Drive Electric Week 2015 Hong Kong. Drive Electric Week is presented by Plug In America, Sierra Club, and Electric Auto Association. The Hong Kong event in 2015 is organised by Charged Hong Kong. First Uber now this! Local eco startup PhatRice.com believes that Electric Vehicles could completely change the way deliveries are done. Tesla’s electric luxury cars have been a huge hit in Hong Kong, with almost two thousand of them now making regular appearances all around town. The Tesla drivers are a passionate group and next week they’ll be kicking off Drive Electric Week, a series of events from Sep. 12 – 20 promoting electric vehicles. During this week PhatRice.com, a local online retailer promoting eco-friendly goods, will deliver all orders using Teslas. Customers receiving packages will even have a chance to sit in the electric luxury car and go for a drive-along. Oh and before we forget, shipping is free as usual! Unlike any other, Hotel ICON is an upscale Hong Kong hotel in the heart of Tsim Sha Tsui East. Standing as a testament to Hong Kong’s creative energy and vibrant arts scene, Hotel ICON showcases work from the city’s celebrated designers and the world’s most acclaimed architects. Offering the ultimate in comfort and committed to service excellence, Hotel ICON’s 262 stylish guestrooms comprise seductive extras, including complimentary wired and Wi-Fi internet connections, smartphone with unlimited mobile data and an ultra-slim 40” Ultra High Definition LED TV. June 2015 Exact Numbers Updated, 146 EV added since May, considered as a high selling month. SAN FRANCISCO, CA, Sept. 2, 2015—An oil field worker, a “hippy chick” race car driver, high school students, celebrities, secretaries of energy, congressmen, mayors and moms will all unite for the fifth annual National Drive Electric Week, boasting more events this year than ever. More than 170 events in 165 cities coast-to-coast, in Canada and Hong Kong will feature plug-in vehicle ride-n-drives and related activities from Sept. 12 to 20, 2015. In 2014, events totaled 152 in 150 cities for an attendance topping 90,000.